Have you ever feel annoyed at the pop-ups that served and powered by Snap containing image preview of the website that the external links point to whenever your mouse hover over the links? There are getting more and more sites that utilizes this Snap Preview Anywhere (SPA) technology which claims to add an informative and sticky experience for visitors. Snap claims that there are more than 25 million websites and blogs that enable the site preview, including TechCrunch, WordPress.com, Laughing Squid and more especially on WordPress and Movable Type blogs made popular by availability of Snap Preview Anywhere Plugin (no longer available) and MT-STA plug-in (no longer available). 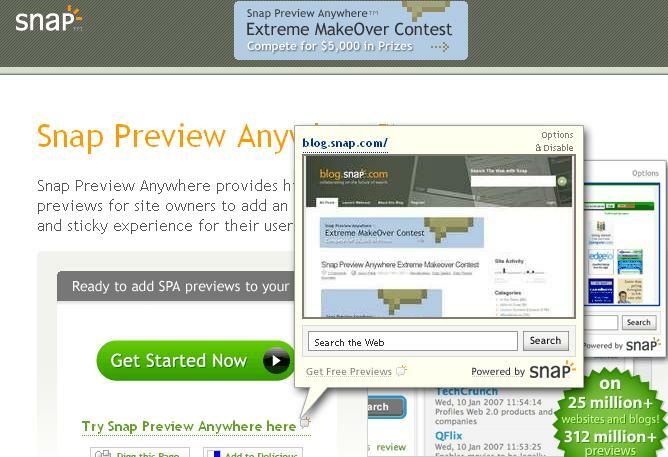 The website and blog owners may get thrilled and attracted by Snap Preview Anywhere bubble popups, however, as a visitor and viewer of a SPA-enabled website, the experience may not be good, sometimes it can be annoying when the popup distracting the normal surfing behavior and pretty useless, as the preview is too small for any usefulness. 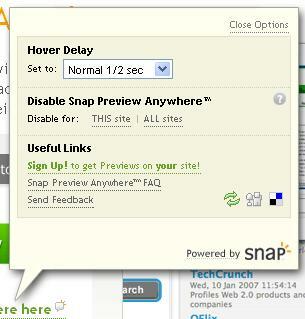 Luckily, Snap provides an easy way to turn off or disable the Snap Preview Anywhere so that the site preview never pop-up and always hidden whenever you hover the mouse over a link. There are two methods to always hide the SPA site preview or disable and turn the SPA preview off. Method 1 is by clicking on the Options & Disable link on top right corner of any Snap pop-up site preview bubble. A few options will be displayed. In the middle section is Disable Snap Preview Anywhere. Simply click on THIS site or ALL site to turn off any popups of SPA for that particular site, or all sites that use SPA. Method 2 is by turning off the SPA on Snap website. Simply go to Snap website (defunct), and will see a FAQ of How can I turn Snap Preview Anywhere on or off?. The answer says Click here to disable SPA. So simply click on the link one time. After click, the Disable (in red color) will change to Enable.